During Galileo's flyby of Io on October 16, 2001 (I32), the spacecraft's camera acquired two mosaics along its terminator that at the time ran along 175-180° West longitude. One mosaic covered the southern hemisphere section, cutting across Michabo Patera, Tsui Goab, Culann, Tohil, and Mycenae Regio. The Galileo imaging team released a version of that mosaic colorized with data from C21 a year later. 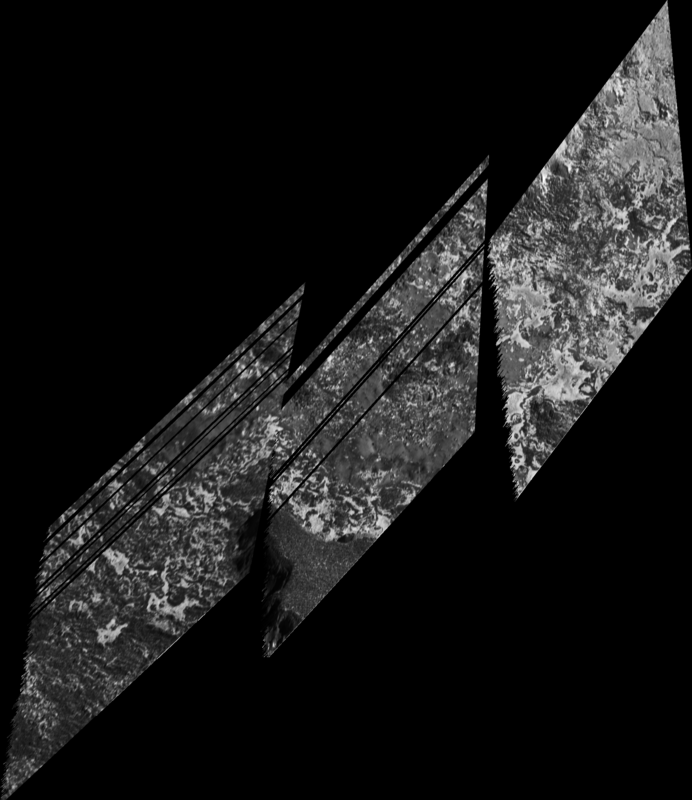 The other mosaic was to cover the northern hemisphere portion of the terrain near the terminator, useful for observing topographic features such as mountains. 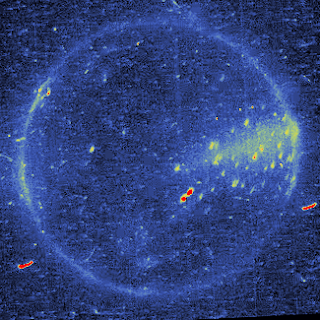 However, during the previous Io encounter, Galileo discovered a new outburst eruption at Thor where no previous activity had been observed. The imaging team decided to adjust the layout of this second terminator mosaic so that it would also cover Thor. 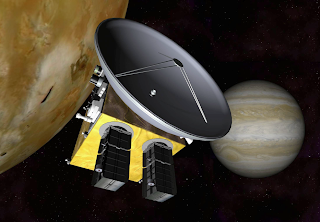 The result was the TERMIN02 mosaic that was returned following the October 2001 flyby. What I wanted to present here is a colorization I have done of this clear-filter mosaic, combining it with color data from three orbits: E4, C21, and I31. The full-resolution version of this color mosaic is also available. The Thor eruption site is at top right and the Zamama plume site is at lower left. At Zamama and at several other sites across the mosaic, we see shield volcanoes, volcanoes where lava has slowly built up a broad mountain with shallow slopes for the most part with the exception of basal scarps along their margin. You can see similar morphology on a much larger scale at Olympus Mons on Mars. You can also see areas where lava has craved broad channels into the sides of these shield volcanoes and onto the plains. 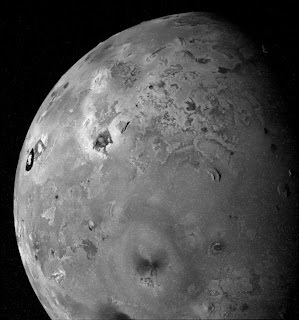 Completely ripping off the idea from Phil Plait, I submit for your approval two heart-shaped volcanic depressions on Io. The volcano on the left is Inti Patera, observed by Voyager 1 on March 5, 1979. 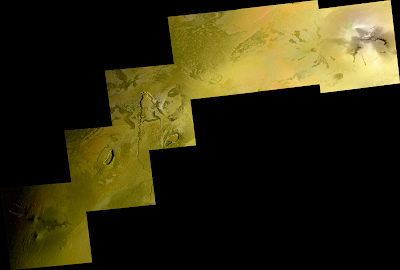 The volcano on the right is unnamed and located at 8.5°N, 71.5°W. 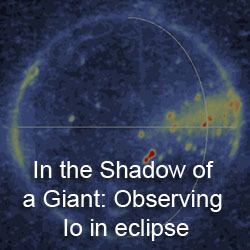 This feature was observed by Galileo on February 22, 2000. Both are somewhat cardioid-shaped. Interestingly enough, both volcanoes have similar characteristics. 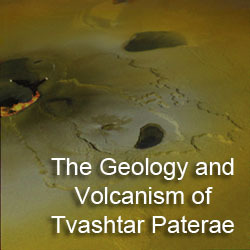 Both paterae have evidence of multiple floor levels, with the lowest portion (to the upper right on Inti, to the left on the other volcano) showing the most signs of activity. Activity at both features tends to also be confined to the outer margins of the paterae, though the volcano on the right has a lower floor that is covered almost entirely by a dark lava flow or lava lake. The majority of both volcanoes have an albedo similar to that of their surroundings, suggesting that lava has not flowed over their floors (except for the lower portions of the floor) in a very long time (>100 years, I'd say). Finally, both show evidence for structural control, pre-existing faults that for part of the boundary for the volcano. This is particularly evident in the volcano on the right, with has a number of straight margins. Again, tip of the hat to Phil Plait. And Happy Valentine's Day! Well, I ended up breaking down and picking up the new Europa book at the University of Arizona bookstore. This 727-page tome by University of Arizona Press covers a number of Europa topics including its geology, the geophysics of its iceshell, its induced magnetic field, and of course, its potential to be an abode for life. 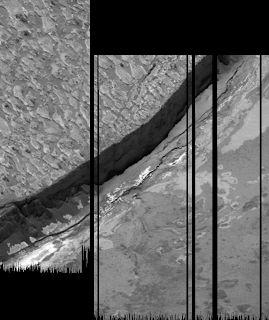 I haven't had much time to sort through it yet; I'm still trying to get through Titan from Cassini-Huygens that was sent to me last month. However, I do like the abundant coverage of Europa geology, which holds much more interest to me than the speculation of whether Europa's sub-surface ocean contains life. This book is edited by Bob Pappalardo, Bill McKinnon, and Krishan Khurana and each chapter has different authors that serve as a review paper for our current understanding of different topics. Right now, I am flipping through the induced magnetic field chapter (by Krishan Khurana) since it certainly helps with understanding the recent Io results. For the last couple of weeks, we have been examining the Io-abstracts submitted for next month's Lunar and Planetary Science Conference. Today we take a look at a paper submitted by William McDoniel, David Goldstein, Philip Varghese, Laurence M. Trafton, and Benedicte Stewart titled, "DSMC Modeling of the Plume Pele on Io." For this paper, the authors modeled the plume of Pele using a curvilinear source region. 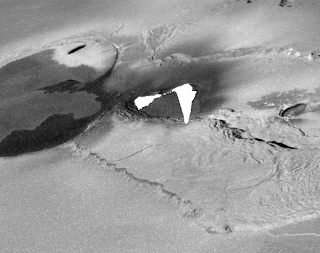 The goal is to replicate not only the extreme height of Pele's large plume, but also the elliptical shape of the red deposit it leaves on Io's surface. This research will be presented as a poster at the Planetary Atmospheres session on Thursday, March 4. During last year's Lunar and Planetary Science Conference, McDoniel and his colleagues reported on their computer modeling of volcanic plumes that erupt from irregularly-shaped vents, such as those that would be expected from the flow front of a lava flow. The group uses the Direct Simulation Monte Carlo (DSMC) method for simulating the motion and properties of gas molecules within a rarefied flow like an Ionian volcanic plume. The method was previously used with great success in 2-D space, which is appropriate for replicating the height, width, and appearance when projected against black space, by Zheng et al. 2003 for a Pele-type plume and Zhang et al. 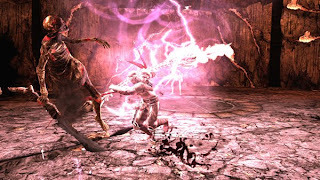 2004 for a Prometheus-type plume. 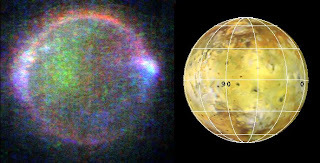 DSMC modeling is also being used to simulate the entire atmosphere of Io as generated by sublimation and volcanism and what can happen to the atmosphere when Io is in the shadow of Jupiter. The work done by McDoniel and his colleagues at the University of Texas in the last few years has been to extend the earlier plume modeling into the third dimension in order to match the 3D shape of Ionian plumes and their non-circular deposits on the surface. As mentioned, last year the authors examined a half-annular vent region, as opposed to the circular vent region assumed by Zheng et al. 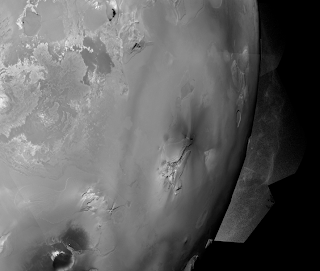 This was done to simulate the Prometheus plume, which is generated by the interaction between warm silicate lava and surficial sulfur dioxide frost at a broad, half-circular lava flow front. They found that such as vent geometry generated a plume that was roughly similar to one generated from a circular vent source, but with prominent jets forming along the inner concave portion of the half-annulus vent area and at the ends of convex side. These jets had some effect on the strength of the canopy shock (the upper bright region of a plume), but the plume deposit was still roughly circular, albeit shifted in the direction of the convex side of the half-annulus source. This year, McDoniel et al. have shifted their attention to the larger Pele plume. The Pele plume is one of the largest on Io and was seen off and on by Voyager 1, Galileo, and the Hubble Space Telescope. Fallout from this plume produces a large red ring that encircles the Pele volcano at a distance of 400-600 kilometers. Two of the major features of this deposit are its elliptical shape where it is more elongated in the north-south direction and its subtle changes in shape and localized intensity over time. McDoniel et al. used a DSMC model of the eruption conditions of Pele (sulfur and sulfur dioxide-rich gas desolving from lava fountaining at an active lava lake) and a Galileo image from the I24 encounter in October 1999 of a portion of the lava lake as a representation of the vent geometry in order to replicate the shape of the Pele plume deposit. There simulations showed an elliptical plume deposit, with the elongation roughly perpendicular to the curvilinear line of thermal hotspots assumed to be vent sources. Closer to the vents, the research found that jets should be created generated by the concave portions of the curvilinear line of small gas vents, including the ends of the line of vents. The jets are associated with areas of greater deposition in the fallout region far from the vent. 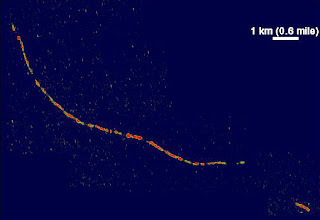 What I think is most significant about this research is that it suggests that a roughly linear Pele-type plume source, like this curved line of hotspots, should produce an elliptical plume deposit. The elongation of this deposit should be perpendicular to the trend of linear source. Variations in intensity of the deposit are related to stronger jets resulting from deviations from the linearity of the plume source, like the concave and convex sections of the source used in the simulation. Now, the exact source they used for their simulation may not be the source of the Pele plume, as there is a much more intense section of the Pele lava lake to its east, as seen during the I32 encounter. Interestingly enough, this intense portion is an elongated depression that is perpendicular to the elongation of the Pele plume deposit, which is what you would expect if it is the source of the plume based on this simulation. Variations in the deposit may result from different portions of this active region turn on or shutting off, producing jets in the plume. Very intriguing research, IMHO! Certainly it provides an explanation for the shape of Pele's plume and provides a possible explanation for changes in the shape and intensity of its deposit on the surface. 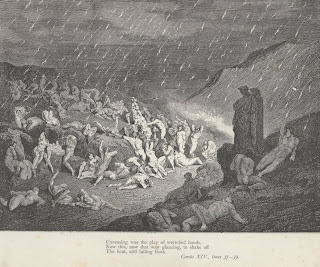 A more linear source would be expected from a fissure-like eruption, which is what you would expect from an explosive eruption that produces a short-term giant plume, like Grian, Tvashtar, Surt, or Dazhbog. This may explain why at least Grian also produced an elliptical plume deposit. For the last couple of weeks, we have been examining the Io-abstracts submitted for next month's Lunar and Planetary Science Conference. Today we take a look at a paper submitted by Giovanni Leone, Lionel Wilson, and Ashley Davies titled, "The Geothermal Gradient of Io: Consequences for Lithosphere Structure and Volcanic Eruptive activity." For this paper, the authors modeled the structure of Io's lithosphere by calculating how its temperature varies with depth. This research will be presented as a poster at the Igneous and Volcanic Processes session on Thursday, March 4. 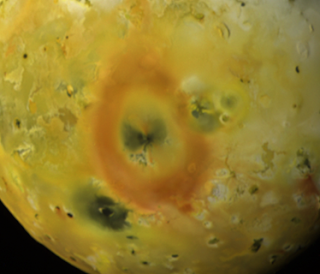 Io's internal heat, generated by tidal stresses on Io's mantle, is released through volcanic activity in a process called advection. As opposed to convection or conduction, with advection, heat is transported from a system through a warm liquid, in this case, liquid hot magma. 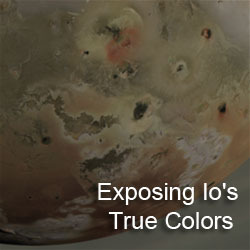 The model used by Leone and his colleagues was first developed in O'Reilly and Davies 1981 in order to explain how Io's lithosphere could be releasing so much heat (2.4 Watts per m2) yet still hold up Io's steep paterae walls and tall mountains. A conducting crust would be far too warm at shallow depths and too thin to hold up these structures. 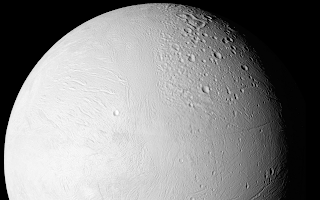 Thus, thanks to advection, all of the internal heat from the asthenosphere is released through volcanic eruptions and the lithosphere stays pretty cool except for the lower two to three kilometers of the 30-kilometer thick lithosphere, preventing viscous relaxation of Io's topography (see the craters of Saturn's moon Enceladus to see how viscous relaxation can distort topography). 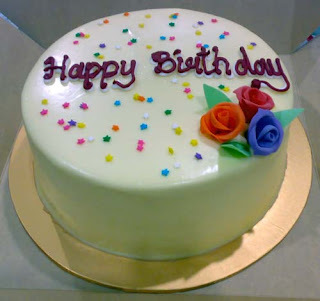 For their model, Leone et al. used two equations from O'Reilly and Davies 1981 as well as improved knowledge about the chemistry and properties of Io's lithosphere to calculate the geothermal (or iothermal, if you will) gradient within the lithosphere, from the cold (100 K) surface to the lithosphere/asthenosphere interface at a depth of 30 kilometers and a temperature of 1500 K. Their inputs include estimates for the porosity of the lithosphere as a function of depth, the density of the magma, the globally-averaged, advected heat flux, radiogenic heatign rate, the magma specific heat, latent heat of crystallization, and thermal diffusivity. From these equations, the authors derived the lithospheric density, pressure, and temperature at different depths in Io's lithosphere. As expected, the lithosphere remains below the melting point of sulfur dioxide from the surface down to a depth of 21 kilometers. It remains below the melting point of sulfur until a depth of 26 kilometers. Much of the lithospheric heating takes place in the bottom few kilometers of the lithosphere. The iothermal gradient generated by Leone's model does support the transport of magma all the way to the surface. 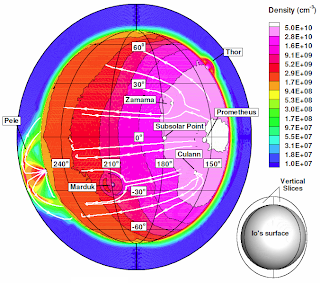 Without any entrained volatiles, magma from the asthenosphere can rise to a depth of 23 kilometers before becoming negatively buoyant and forming magma reservoirs, assuming a pore-space fraction of 30% at the top of the lithosphere. As mentioned above, this is within the depth range of the melting point of the dominant volatiles on Io, sulfur and sulfur dioxide. These may then become entrained in the lava, allowing the magma to rise further to the surface. Leone et al. conclude that with volatile contents as low as 5% by mass, magma should be able to reach the surface using reasonable values for lithospheric porosity. With even more volatiles, such as the 10-30% suggested at some plume sites like Tvashtar, the modeled iothermal gradient would support the kinds of high eruption speeds observed at that volcano. They conclude "that there should be a positive correlation between mass eruption rate and volatile content." 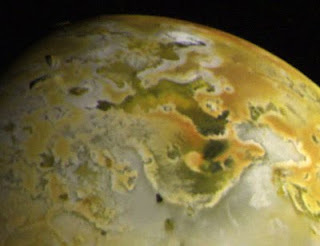 So it should not come as a surprise that major eruption on Io, like Tvashtar 1999/2001/2007, Thor 2001, Grian 1999, and Pillan 1997 all had volcanic plumes. 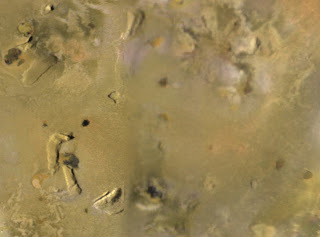 Finally, they also place a limit on the porosity of Io's lithosphere at the surface at 38% as magma could not ascend into the lithosphere above that level, the crust would be too light. Another factor that the authors examined was the effect that changes in the advected heat flow would have have on the lithosphere. Just as Kirchoff and McKinnon found last year, a decrease in volcanic activity but not a decrease in the amount of heat generated in the mantle (i.e. the temperature remains the same) would leading to a heating of the lower to mid-lithosphere, possibly leading to some melting. In Leone's model, the gradient changed from a steep curve at 2.4 W/m2 (remaining relatively cool until close to the lithosphere/asthenosphere boundary) to a much shallower one at 0.5 W/m2. 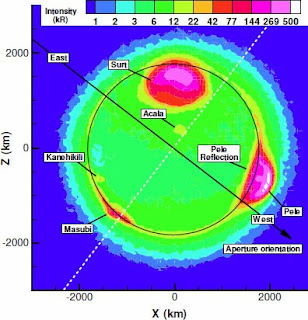 With this model of Io's geothermal gradient, Leone and his co-authors have placed limits on the amount of pore spaces are possible in Io's lithosphere. 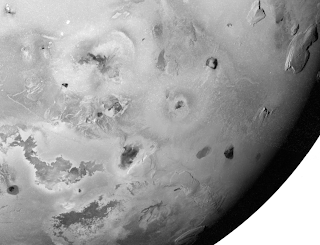 Their model is supported by their ability to replicate the ascent of magma to the surface, which is readily visible on Io's surface. Their model also helps support the argument that the volatiles in Io's lava are incorporated into its magma within reservoirs in the lithosphere. 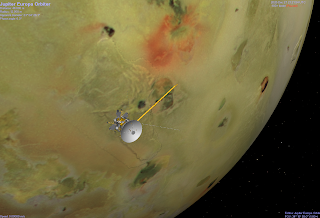 I would be interested to see how this model fits with the view that the upper 2-3 kilometers of Io's lithosphere maybe dominated by volatiles with silicates being predominant deeper into Io.